Last edited by leoniet; 05-17-2013 at 04:28 PM. 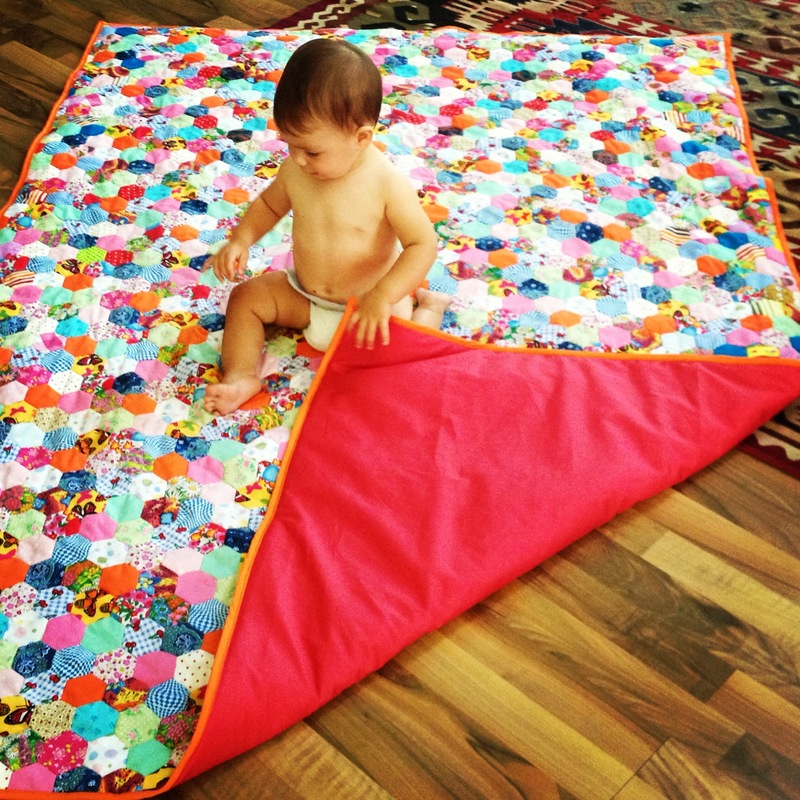 Cute baby - cute quilt! You could have the ends on either side of the quilt. Yes....tie it! That will solve many issues with quilting after putting the binding on. But the spacing between the ties will be dependent on the batting used. Unless you have the packaging from the batting to tell you the recommended quilting/tying spacing (or remember what exactly you used and can find it again) I would put the ties fairly close, probably 3-4 inches apart. With all the work you put into the quilt, you certainly don't want the batting to fall apart inside the quilt! Very nice quilt....bright and cheery! Tying it will work. To quilt, SID is often used, or a design in each hexagon. what an impressive undertaking for your first! Pretty top! I too thinking tying it would be sufficient! I agree with tying -- it won't give you the risk of puckers that stitching would, in case there is any extra fabric on the front or back (or if it stretches with the quilting). Honestly with this kind of pattern I prefer a tie anyway. Lovely quilt, and beautiful daughter! Wow thanks guys Just looked into tying and that seems an AWESOME idea! And so pretty too. I could use all different coloured threads.......BUT I've no idea on the batting. I got it from a generic fabric shop and I'm pretty sure it's polyester and it's fairly thin-ish. Is closer always better for spacing of the ties? And thanks for all the lovely compliments about baby/quilt too! Closeness of ties (or quilting) depends on what the manufacturer suggests as a minimum. You can always do more. You also have the option on knots in the center of a block or at an intersection. Do what pleases your eye! And congratulations. Since I gain weight reading cookbooks, why can't I lose weight watching a fitness program? You can also do charm tacks, which are little shapes, like hearts, bunnies, etc. You can place them a few inches apart here and there. I have seen people use make a star (like the ones we did as kids with the 5 sides using one continuous line), make squiggly flower shapes, use cookie cutters, wooden shapes you get in craft stores, coloring book characters, etc. Just draw a chalk or pencil line around the shape or freehand on the machine and do them here and there instead of tying. what kind of batting did you use and how far apart does it recommend for quilting. I think I would quilt it as recommended for your batting you would not have to quilt right up to the binding I really don't think it will bunch up on you. Your quilt is really cute. The batting you are using will determine how close together the ties need to be. If the batting requires quilting lines 4" apart, you actually want to have ties closer than that in all directions (because ties do not secure the layers as much as quilting lines do). Ah, you see I didn't know to check on the batting when I bought it. It was just from a generic extra-wide roll in the fabric shop! I'm almost certain it's standard polyester so I think I'll go closer with the ties than not, to be on the safe side. Thank you everyone! I think a knot at every intersection might be a bit harder to tie - but I also think it would be easier on the fabric - more layers, so less stress on any layer. That makes sense bearisgray - thanks. Would you use a particular kind of needle? I was just looking into it and have come across the concept of Betweens but can you just use a standard embroidery needle for tying? I agree -- tie at the intersections. If the batting is polyester it can probably be tied further apart, but since it will probably get washed a lot, I would tie more rather than less. If you can, make up a sample from scraps to experiment with ties. The needle you use will depend largely on what you decide to use for the tie -- embroidery floss, yarn, crochet cotton, etc. Be aware that choosing something like yarn can mean you need to use a needle with a very large eye which, in turn, can be very difficult to work through the layers. Betweens are probably neither long enough or strong enough for most ties. Usually you want a fairly long needle to tie. Also be sure to check out tying techniques on the internet. When I started, I thought you would put a tie in, cut the thread, then tie the knot. However, there are ways of doing it so that you tie knots continuously and cut the thread only after a whole section of knots has already been tied. You also need to understand how to tie so the knots don't come out. A practice swatch is good because you can make sure that your choices are going to work efficiently for you. Thanks everyone! And Prism 99 - good idea on the sample piece. Thanks. I'm going to try Pearl Cotton Embroidery Thread first as I have some lying around and we'll see! This is so kind of you all. So glad I get to finish this project properly. To tie or machine tack would probably be your best bet. If you try to do straight line quilting you would probably end up with some puckers on the back and might need to re-bind. Looks like your baby thinks it looks terrific! I agree, I would triple tie it. A crisis is merely a design opportunity and in your case you're being given many ideas to "solve" your problem. Before I read the responses I immediately thought tying it, too. The other ideas are great too. Cute first quilt and adorable baby!! I think I would machine tack, or use a design from the sewing machine. Hearts here and there? Thank you so much again everyone. Wise words, Jan in VA! The batting maker will tell you on the package how far apart to put your quilting.